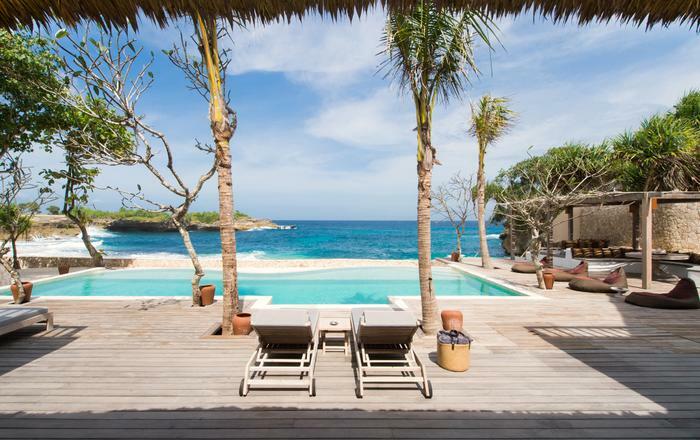 Villa Mia is a 5 bedroom beachfront villa that has everything you could dream of for a luxury seaside escape. 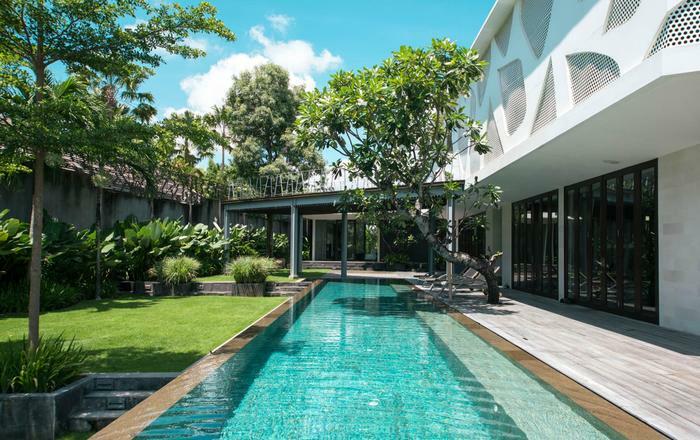 Located in Chaweng beach, Villa Mia offers privacy and relaxation whilst being in easy reach of many top attractions and places to eat. 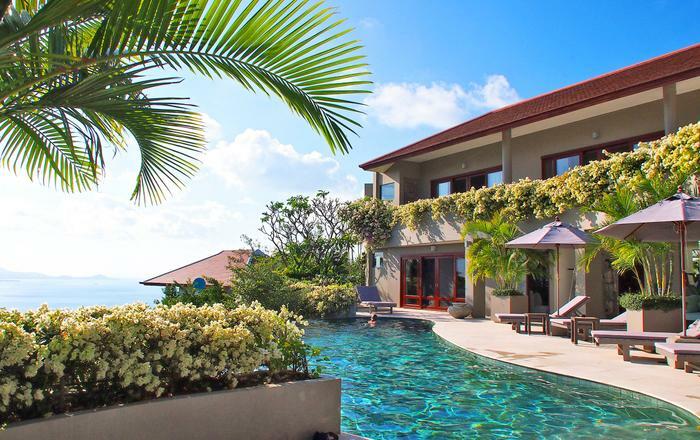 The villa itself has a magnificent swimming pool, large outdoor Jacuzzi surrounded by tropical plants, fitness room, alfresco and indoor lounge areas and generously sized bedrooms. It is the perfect place for families or groups of friends to kick back and relax. The spacious open-plan living area is the central focus of the villa's interiors, with long comfortable sofas and a large flat screen TV it makes a great place to relax in the evening. The large fold-away glass doors allow the interiors to seamlessly blend with the villa's extensive outdoor spaces. 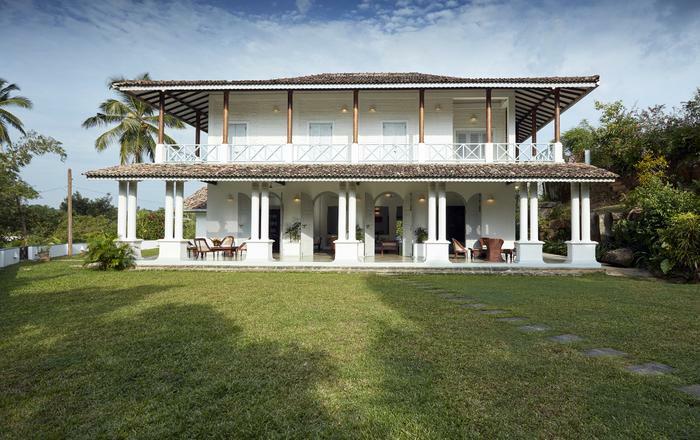 There is an outdoor lounge, two covered verandahs and a large well-kept lawn furnished with loungers and parasols. There is also a private gym for the more active members of the group. Villa Mia's fully equipped kitchen is defined by a long island feature which has a built-in wine cooler and subtle black hobs, whilst the adjoining dining table can seat ten. Outside guests can make use of a Thai style kitchen with BBQ and large alfresco dining table for a sociable meal drenched in the surrounding views. 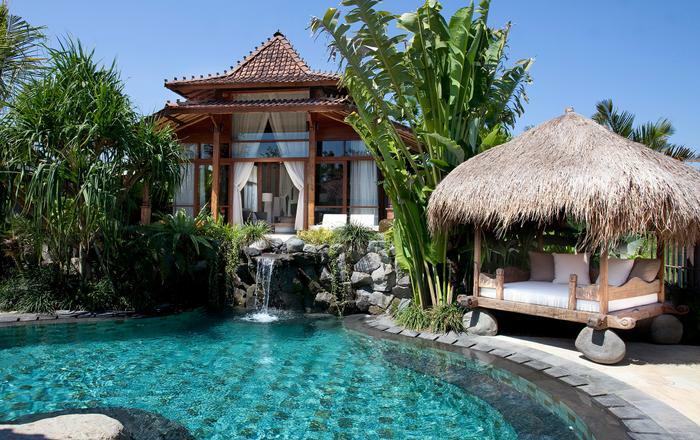 The crowning feature of Villa Mia is most certainly the magnificent 23 meter lap pool tiled in Balinese green stone, within which sits a large sunken covered Sala with comfortable lounge seating: a truly unique feature of this villa. The pool also has a shallow end that is well suited to the younger members of the group. Elegantly furnished, the bedrooms feature king size beds, satellite LCD TV and DVD players, built-in wardrobes, personal safes, mini-bars and large mirrors. Each bedroom has its own en-suite bathroom with a walk-in rain shower, twin sinks and a small private garden with tropical plants plus either an outdoor rain-shower or an indulgent terrazzo bathtub. All bedrooms overlook the pool and have direct access onto the pool deck. The villa has highly-trained staff who are on hand at all times to ensure that your every holiday need is satisfied. Staff include an English-speaking villa manager, housemaid, villa handyman and trained Thai Chef. 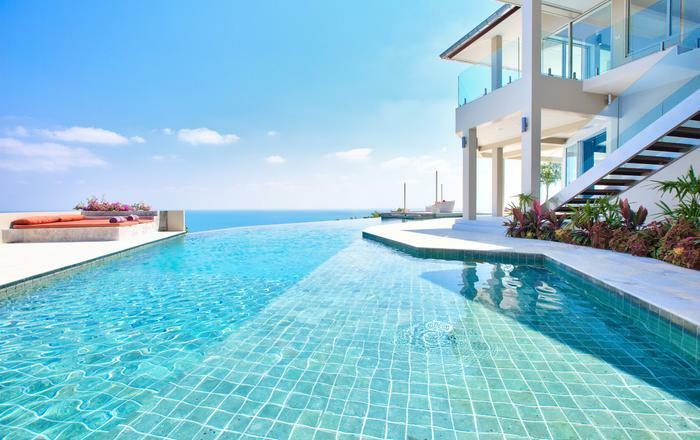 Villa Mia is ideally located on the beach at the quiet northern tip of Chaweng Bay, it provides serenity and privacy within walking distance of restaurants, nightclubs, bars, cocktail lounges bars and shops. The scenic island of Koh Matlang is so close that at low tide guests can walk the white sand bank all the way across to it. 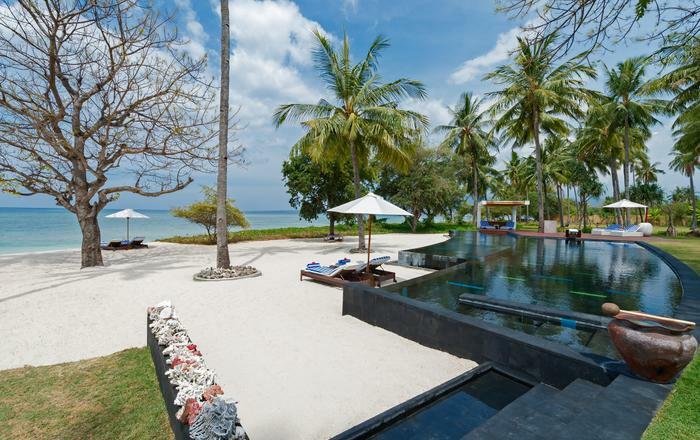 Guests interested in outdoor activities will not be disappointed either: Villa Mia is within easy reach of Samui Bungee Jump, horse riding, elephant trekking, various water sports and sightseeing tours to Angthong Marine Park. Dear shalomi, it has been a pleasure to have met you. i would like to thank you and the great hospitality which have been shown by the staff. coming from dubai and used to luxury services and top class accommodation, i can say with true honesty that villa mia is beautiful, food was excellent, service was five star and incomparable to any five star hotels, and of course the staff were friendly and very helpful. joy, the villa manager, is a great host and she is of a great asset to the owner. i thank you once again for such hospitality and i shall look forward for a next time visit. you should creat a slogan for villa mia " make your thoughts come to reality" and " you name it, we got it for you" good luck and all the best. This might have been the best vacation we have ever had. everything we could have possible imagined was procured. food and service were impeccable. the pictures are exactly how the place looks. every detail of our trip was taken care of, no detail forgotten. its the land of the lotus eaters, you will forget to want to go home. everything was fantastic, thank you again. we hope to do this again very soon. Villa mia was absolutely amazing. it was everything i expected it to be and more! 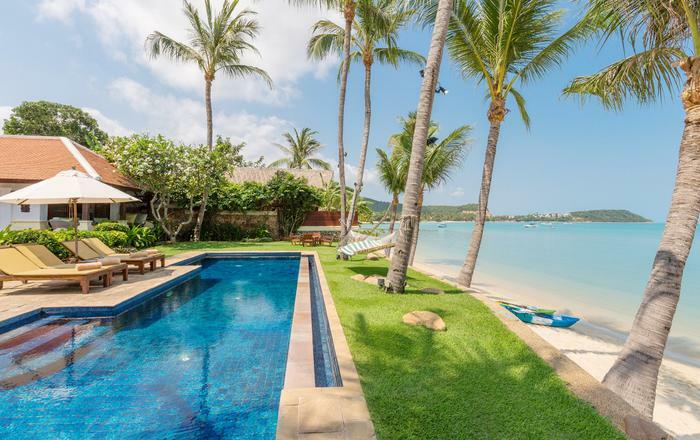 the location for a villa is priceless as it's the only one located on chaweng beach close to town. the villa front beach and ocean isn't the cleanest but the property is so perfect, you'll never want to leave!